In 1982, the eccentric Viscount Mountgarret, who often behaved as if he lived in the 16th century, twice fired his shotgun at a hot-air balloon that had floated too low for his liking over his grouse moor at the start of a drive. He was subsequently fined £1,000. The incident created just the sort of damaging, Colonel Blimp image found in the old Punch magazines and perpetuated in modern times by the popular press. But this isolated event and subsequent caricature could not be further from the true image of contemporary grouse-moor owners, who have not only become the providers of superb sport and kingpins of the rural economy, but also the champions of conservation. In the early days of the sport, the vast, unspoilt heather moorlands, mainly in Scotland, northern England and Wales, supported dense grouse populations that permitted the taking of very large bags, which would now, quite rightly, be regarded as excessive. The biggest individual bag on record came on August 30, 1888, when Lord Walsingham killed 1,070 grouse to his own gun, on Blubberhouse Moor in Yorkshire. With 40 beaters in two teams, the first drive started at 5.12am and the last, the 20th, finished at 6.45pm, following which Walsing-ham rounded the day off by walking home for a further 14 birds. Today, much has changed. Not only are modern gameshooters more concerned with quality than quantity-seeing the quarry as an integral part of the ecosystem-but also hitherto vast tracts of pristine habitat have been eroded and degraded by man’s spread and development, the encroachment of forestry and agriculture, changes in farm practices, insufficient preda-tor control and overgrazing by burgeoning sheep and deer populations. The approach to red-grouse shooting is entirely different from that to partridge and pheasant because, although grouse can be reared, it’s very difficult to get released birds to adapt to a natural diet. Thus, the overwhelming concentration has been on habitat control since the introduction of driven shooting largely superseded walking-up in the 19th century. The chief weapons have been rotational heather burning, to ensure nutritious young plant shoots for food and older vegetation for nesting and cover, and control of predators such as foxes, stoats and crows. But even on the best-managed estates, the grouse has always been subject to cyclical popu-lation fluctuation through disease, especially the strongyle-type nematode worm, which enjoys mild, wet conditions and has thrived during recent warm winters. 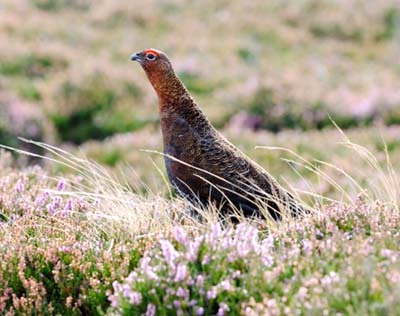 Fortunately, grouse research has come a long way, spearheaded by the Game and Wildlife Conservation Trust (GWCT), and the promotion of medicated grit to combat disease has paid dividends. Much of the relatively new interest in grouse research and the funding of programmes has been generated because the sport is a major source of revenue, especially in Scotland, where it underpins the rural economy in many remote areas. A GWCT report in 2010 revealed that grouse shooting generated at least £23.3 million per annum for the Scottish rural eco-nomy and supports more than 1,070 full-time equivalent jobs. Further-more, it’s widely recognised that not only is Britain’s remaining heather moorland still with us almost entirely because of shooting, but also that that habitat has become a precious reservoir of wildlife. Ironically, we are now fighting to preserve this manmade habitat, which holds grouse at an unnaturally high level. Today’s progressive moor owners could hardly be more different from the Walsinghams of old. Take, for example, Wemmergill, which had a record bag of 8,532 brace in 1872. In 2006, the 17,000-acre moor was sold by the Bowes-Lyon family, after 444 years, for £5.25 million. It was bought by self-made entrepreneur Michael Cannon. In 2003, he had already paid a £4 million premium for a 40-year lease of the estate’s sporting rights, and, since then, has spent more than £3 million on utility buildings and upgrading infrastructure before embarking on the restoration of thousands of acres of important habitats that have become degraded. Of course, the majority of moor owners can’t inject sums on such a scale, but many have invested more modestly. For example, it’s heartening that, in Scotland in recent years, 41% of estates, through shooting lets, have recovered all their costs in producing grouse, compared with the early 1990s, when only 1% did so. This is encouraging neighbours to do likewise. There is always great anticipation regarding the season’s shooting prospects-each year, the birds are monitored closely, chiefly through GWCT counts, of pairs in spring, to see how many have survived the winter, and in July to early August, to determine how many chicks have survived, especially during the critical period in late June/early July, when they’re starting to forage for themselves. As usual, this year, irrespective of recession and what the elements can bring, most let shoot days have long been snapped up-at the top end, there’s never enough to satisfy demand. On a leading moor such as Leadhills in south-west Scotland, the going rate is about £150 plus VAT per brace, which means that, on a 200-brace day, a team of eight guns might spend £4,500 each. Walked-up shooting generally costs less than £75 a brace and the bags are far smaller. It’s the sport of the purist, but without driven shooting, moors would not survive. Through specialist sporting agents and increasingly through estates’ own websites, the packages are many and varied, not forgetting the extra costs of accommodation, tips and so on. Apart from factors such as disease and rising costs, there are other concerns in grouseland. For example, the Moorland Association of England and Wales points to the EU’s ban on Asulox from the end of this summer (2012). It is the only selective herbicide currently licensed to spray bracken on the open moor and, without it, the fight to stop highly invasive green bracken swamping the purple heather will be far harder. Then, there’s the continuing controversy over protected predators, especially the hen harrier. Wildfires and uncontrolled dogs are also major problems, especially as more and more people visit our precious uplands. But there is some good news in Natural England’s relaunch of the Countryside Code, which stresses these dangers, for example, stating that barbecues and open fires are illegal on open moorland and dogs must be kept on a short lead between March 1 and July 31 to protect ground-nesting birds. In Scotland, they say that the grouse fly more dramatically than in England because the landscape is more dramatic and the weather less predictable, but the moors of northern England certainly have their special charm, too. Wherever you venture this season, enjoy both the early hot, sunny days, with larks singing and the honey taste of heather pollen on your lips, and the later wild, wet forays, when the grouse come at you like a squadron of Harrier jets.